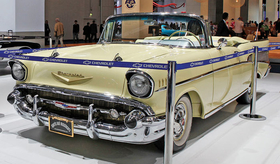 The Chevrolet display of the 1957 Bel Air convertible in Frankfurt is part of GM's plan to differentiate Chevy from Opel in Europe. FRANKFURT -- Set in the middle of the Chevrolet stand at the auto show here, the 1957 Bel Air convertible might have looked out of place if it weren't for two other classic Chevy models nearby. Flanked by an early Corvette and a 1941 Master Deluxe, the iconic '57 Chevy was making a statement: Chevy is an American brand with a heritage that it is proud to display. This wasn't just an exercise in bow-tie pride. Playing up Chevrolet's U.S. identity is a key component of a tricky marketing challenge for GM in Europe. For decades, General Motors Co. had one mainstream, volume brand in Europe: Opel. But GM is on track to sell about 500,000 Chevrolets in Europe including Russia this year, company officials say. Many of those cars are built on the same architectures as Opels and use many of the same components, giving GM the task of keeping the two brands separate in consumers' minds. "We work hard to keep the brands apart, and we are so far, by research, very successful," Nick Reilly, president of GM Europe, said in an interview. 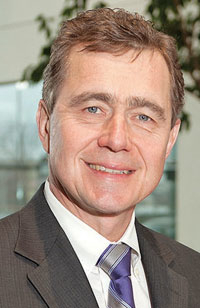 Although U.S. brands have had mixed success, at best, in Europe, Chevrolet Europe brand boss Wayne Brannon says Chevrolet's American identity gives it unique character in Europe. "That separates us from every other brand in Europe," Brannon says, adding that classic car clubs for Chevrolet and Corvette owners form a good base for the identity. Ford, the only other U.S. automaker selling at high volume in Europe, generally is seen as a European brand here, he says. Stracke: Opel will push to compete with Volkswagen. GM also will position Chevrolet as a value brand while pushing Opel upscale. Chevrolet has converted its lineup, dropping the rebadged Daewoo vehicles that it sold as low-priced entry vehicles. So moving into value-oriented mainstream pricing is a step up. Opel, meanwhile, will push to compete with Volkswagen, which has a near-premium image in Europe, says Karl-Friedrich Stracke, CEO of Opel. He says Opel will spend 11 billion euros, or about $15 billion, over the next three to four years to expand the lineup by 30 vehicles. "We want to differentiate it very clearly from the Chevrolet brand in Europe," he said. Reilly says Opel is recovering from image damage suffered during GM's 2009 bankruptcy, when GM first said it would sell off Opel and then changed its mind. He said Opel's European identity stands in clear contrast to Chevrolet's American heritage positioning. "The way the brands are perceived and presented are kind of like chalk and cheese," Reilly said. "We deliberately emphasize Chevy's heritage. It's got 100 years, and it comes out of the U.S."
He added: "When we survey Chevrolet buyers and say, what else did you consider, Opel does not get on the list, and if it does it's right down on the bottom. And the same is true the other way around."